We will discuss about the rotatory motion of the earth. Suppose, if we spin a top, it rotates around its pointed end. Just like the top, our earth moves all the time spinning on its own axis, from west to east. The imaginary line passes through the north and south poles of the Earth is called the axis of rotation. This spinning movement of the Earth is called rotation. The earth completes one rotation on its axis in about 24 hours (i.e. one day and one night). Due to its spherical shape, half of its spherical area gets light from the sun and the other half remains in the dark. For about 12 hours one half area of the earth is lighted while the other half remains dark during the same period. 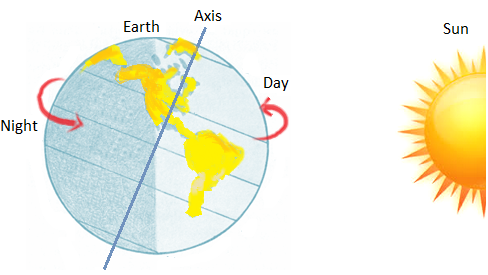 We say there is day in half of the sphere for about 12 hours and in the same period there is night in the other half. The next twelve hours, the position would be reversed, i.e. there will be night in the first half and day time in the second. Days are warmer while nights are cooler. As the earth rotates from west to east, the sun seems to rise in the east and set in the west. At noon when the sun comes over our head, it gets too hot while in morning and evening we do not feel so hot. Thus, daily rotation of the earth affects the weather.